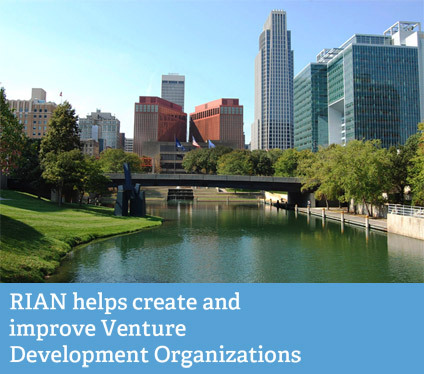 RIAN and the community of Venture Development Organizations (VDOs) are transforming regions across the United States through strategic investments in innovation, entrepreneurship, and technology - one company at a time, repeated hundreds of times over. Explore this site to learn more about VDOs, find examples of their client successes, join the discussion for improving regional economic development, and bring new thinking, new practices to your own economy. The Regional Innovation Acceleration Network supports the community of existing and emerging VDOs around the country by providing the means for peer-to-peer sharing of information and best/common practices and helping to identify funding opportunities for VDOs; and provide tools to help regions approach the creation of their own VDO. A VDO is a business-driven, public or nonprofit organization that promotes regional growth by providing a flexible portfolio of services, including: assisting in the creation of high-growth companies; providing expert business assistance to those companies; facilitating or making direct financial investments; and, speeding the commercialization of technology. 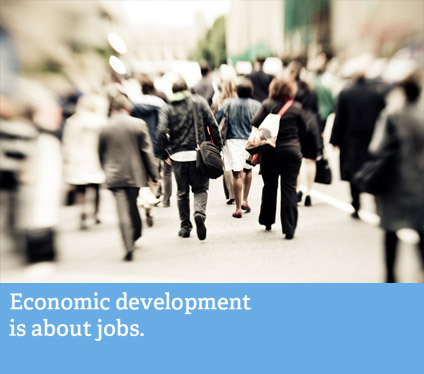 In 2010, 121 net new jobs were created. Active and graduate clients generated $52 million in revenue in 2011. Companies have created more than 1,100 jobs in 2007. Since 2002, client companies have raised more than $166 million in follow-on funding. Graduated incubator tenants have created 2,278 jobs since 1989. Between 1998-2008, a total of $200,582,440 of downstream funding attracted for program's total investment of $6,278,344 in 108 companies. Since operations began in 2006, the cumulative amount of follow-on capital attracted by clients totals $201 million. Since 2003, client entrepreneurs have raised $160 million in financing with our assistance. Since 1985, client companies have raised more than $700 million in funding. Since 2004, 30 resident companies employ more than 100 people with cumulative total wages exceeding $4.5 million. Since 1999, more than100 companies have used $10.2 million from the Concept Fund to leverage more than $253 million in private capital—that’s $29 of private capital for every public dollar invested through the Fund. Since start of operations in 1995, our programs have led to an increase in total employment of more than 2,400 positions. Portfolio companies have created almost 2,000 jobs in the New Orleans area. In 2010, PCV engaged with 200 companies, helping to support 3,000 jobs with total wages exceeding $50 million. Since 2002, clients have captured more than $217 million in investment & equity. Since 2002, clients have added more than 7,000 jobs with a payroll over $250 million as a direct result of our work. 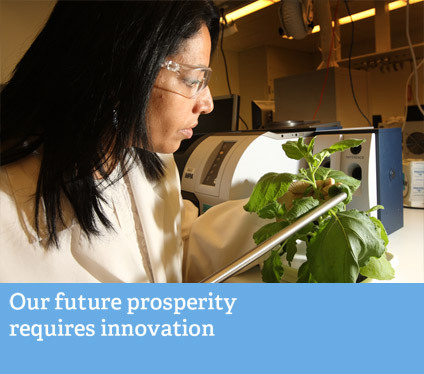 In 2012, 583 jobs were created and retained through Innovation Works assistance. Over 25 years, 400+ startups have attracted more than $110 million in investment. Connecticut Innovations activities have resulted in more than $1 billion in private equity investments since 1995. In-house clients employ more than 100 individuals with an average wage of over $60,000. Since 1980, ATDC has graduated more than 120 companies, which have raised more than $1 billion in additional funding. Since its inception in 2002, eBizITPA has created 775 jobs. Between 2003-2010, clients have raised $89 million in angel capital, $82 million in venture capital, and an overall total of $183 million in investment. Since 2007, companies have attracted more than $98 million in private co-investment. Since start of operations in 2006, average salary of the jobs created is $64,000. Since 2004, portfolio companies have raised $512 million in risk capital. Since 2003, client entrepreneurs have secured $268.5 million in revenue with our assistance. More than 600 new net jobs have been created by companies in the Tech Collaborative incubation program since 2000. More than 2,000 jobs have been added by clients over 10 years of operation. The more than 450 companies worked with have captured over $80 million in investments since 2007. Tech Collaborative have recruited more than 125 full-time employees for member companies, with an average salary of $70,000. In 2012, companies supported by Innovation Works' seed fund or accelerator raised $209 million in additional funding. OEN's Angel Oregon program companies have earned $109 million in revenue since 2005. Since 1999, supported companies by ECJC have created 829 new jobs. In 2012, companies assisted by Innovation Works achieved $1.5 billion in revenues. In 2011, PCV companies created 212 jobs – a growth of 8%. In more than 10 years of service, clients captured more than $40 million in VC. Companies have generated over $50 million in annual revenue since 2007. Since 2007, assisted companies have created 133 jobs. Seed capital investments have been leveraged into over $100 million from private investment since 1994. In 2011, center clients reported $26.2 million in total revenues. The six-year total is $137.3 million. Client companies have earned $186 million in revenue since 2002.. The over 475 early stage companies which have received investments by BFTP of Southeastern Pennsylvania have raised over $1.2 billion in follow-on investment. Since investment activity began in May 2007, portfolio companies have created nearly 340 jobs at an average annual wage of $63,000. Average wage of all clients in 2009: $64,669 (twice the average local private sector wage). In 2010, BIC activities created 93 new jobs. Over the past five years, activities have created 342 new jobs. Client companies were able to secure an additional $40 million from investors in FY 10/11.. Existing and graduated clients employ more than 50 people, including full-time, part-time and contractors over the past seven years. Since 2000, portfolio companies have raised over $100 million in equity funding. 29 companies receiving investments have created 550 jobs since 2006. More than 600 people have been employed by the 42 companies of OEN's Angel Oregon program since 2005. Between 1999-2011, capital raised by clients and graduates total over $1 billion. From 2006-2010, an average of 301 net jobs were created annually, at a rate of 1.79 jobs created per client. Over 25 years, the 400+ startups begun through the center employ more than 4,000 individuals. Wages and salaries for clients' employees totaled $16.7 million in 2011. For the past six years, total wages earned exceed $69.4 million. During 2006-2010, staff involvement with businesses resulted in 10,338 jobs leading to $440 million in total payroll. Since 2002, client companies have created more than 550 jobs. 1,190 full-time employee positions were created by 93 client firms over the previous 10 years. An additional 262 part-time jobs were created, too. In FY10/11, nearly 500 jobs were created as a result of BFTP/CNP efforts, and an additional 68 jobs were retained. Since 1999, client companies have realized $90 million in sales revenues, $18 million in the last year. In 2010, clients produced $98 million in revenue. Over 12 years, companies have obtained $1.25 billion in funding. More than $1.3 billion in funding has been attracted by 110 companies created, recruited, and accelerated since July 2002. 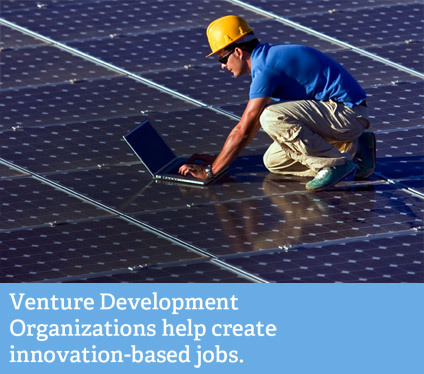 Since 2007, supported companies have created 1,085 jobs. From 2010-2011, clients achieved revenues of $333.9 million. The portfolio of companies generates over $100 million in annual revenue. In FY2011 27 portofilio companies raised $35 million in investment capital. Ben Franklin Technology Partners of Northeastern Pennsylvania has helped create more than 15,000 jobs since 1983. Funded companies created 110 new jobs in 2010, and total of 1,566 jobs between July 2004 and June 2011. Between May 2007-October 2011, companies have achieved nearly $100 million in revenues. In 2009, clients created 1,275 jobs. In less than a year, companies have created 85 jobs. Since start of operations in 1995, total wages of client businesses amount to more than $152 million. Between its Technology Commercialization, National Center for Defense Robotics, and business startup and support, Tech Collaborative companies have generated almost $83 million in additional funding between 2000 and the middle of 2009. OEN's Angel Oregon program companies have accumulated $75 million in investments since 2005. In 2010, job growth at PCV financed and advised companies was 9%. Client and portfolio companies have reached annualized revenues of $78.6 million. Between FY99-11, nearly $216 million has been leveraged for more than 1,500 projects.. Since 2006, the 29 companies receiving investments have obtained $63 million in additional private capital. In 2011, clients and gradutes raised $67 million in capital. Between 1995-2008, investments created an annual average of more than 1,600 jobs. In ten months, companies secured $7.2 million in private investment. In 2010, clients attracted $167 million in new investment. Since 2005, companies receiving CIT GAP Funds have attracted almost $78 million in private equity. Since 2002, 66 life sciences companies in the investment portfolio have attracted over $730 million in additional capital. Between 1999-2011, clients and graduates have created 3,625 jobs. Average wages of portfolio companies in FY2012 were more than $70,000, 90% higher than the state average. Is Your Organization Fit for Funding? Funded by the U.S. Economic Development Administration (EDA). © 2019 Regional Innovation Acceleration Network. All Rights Reserved.